PROVIDENCE, R.I. -- An 800-pound zoo animal rammed its way out of its enclosure and ran around a Rhode Island zoo for an hour on Tuesday before being sedated and captured. One animal keeper and one veterinary intern were treated on the scene for minor injuries. 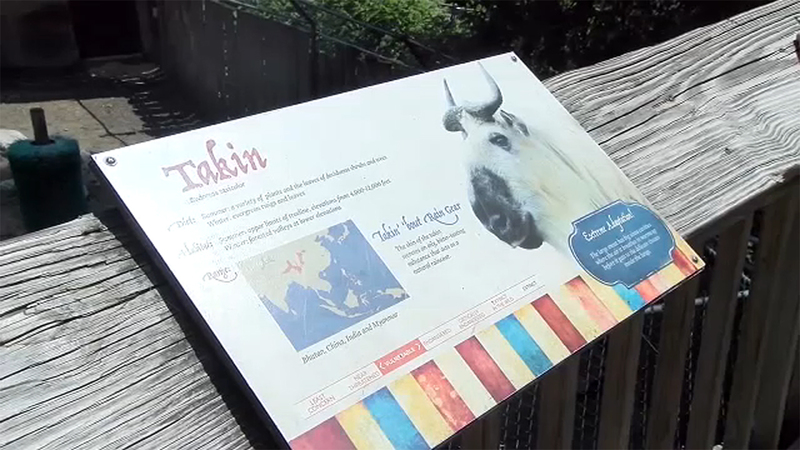 The takin escaped just after 9 a.m. at the Roger Williams Park Zoo in Providence. It was captured by trained zoo staff about an hour later, before the zoo opened for visitors. The massive (363 kilogram) animal is described as a "goat-antelope." The horned animal named Har-Lee lives alone in his enclosure in the middle of the zoo and has never escaped before, said zoo spokeswoman Diane Nahabedian. He's fine, but is being monitored, Nahabedian said. The enclosure is being evaluated to ensure he can't escape and he's safe, she added. It started when a veterinary team approached the takin for a routine hoof procedure. The animal charged the heavy reinforced doors multiple times, finally breaking through onto zoo grounds. Har-Lee was sedated and taken back to an enclosure. If the zoo was open at the time, visitors would've been ushered by security into buildings, Nahabedian said. On a typical Tuesday when school groups are visiting, the zoo could have a couple thousand visitors, she added. Takins are native to the eastern Himalayas. Har-Lee arrived at the zoo in 2012.